These essays touch on similar themes explored in Caleb Good’s essay, “Working for the Environment” published in March and Christine Milne’s, “Things are crook in Tallarook”. Right now, across Australia, people are in different ways trying to come to grips with the fact that we are witnessing the end of coal. While governments reassure us that the recent decline is only temporary and that projects will go on, investors continue to pull out of new projects and the legal and social foundations on which projects depend continue to fall away. Nowhere is this felt more keenly than in communities that rely heavily on the coal industry for jobs and regional economic development. Across Australia, communities have long been divided around the local impacts of coal and what to do to address these impacts – in North Queensland, strong groups supported by tourism operators have mobilised to protect the reef against dredging and dumping; Hunter Valley community groups have highlighted the health impacts of coal dust; local people in Port Augusta have proposed innovative energy projects in the face of electricity plant closures; and, in the Latrobe Valley, there has been strong community mobilisation around the impacts of the Hazelwood mine fire. Local issues have in turn been tied to broader, national campaigns around climate change, changes to environmental protection laws, the financing of fossil fuels, and the need for increased support for renewable energy. Consequently, coal ships have been blocked, banks have faced divestment campaigns, jobs myths have been busted, legal battles have been won, new mines continue to look uncertain, and, in the case of Queensland, state governments have been changed. The environment movement has had some wins. But more significant than the victories themselves are the implications of moving our economy beyond our current dependence on fossil fuels. We have arrived at a new juncture, one that has the potential for broader and more radical transformation – not only in terms of transforming the energy sector, or seeing meaningful action on climate change, but in terms of catalysing a fundamental shift in the way our economy works. This is a big claim. Yet it is a claim grounded in shifts I have had the privilege to witness across Australia, in communities that are quite literally ‘at the coalface’. One such shift is happening in the Whitsunday Region in North Queensland, where the Abbot Point Port expansion and rail project is planned in order to open up the Galilee Basin to coal mining. Around a year ago, I was invited to present alongside Tim Buckley from the Institute for Energy Economics and Financial Analysis (IEEFA) in Mackay and the Whitsunday region. Tim presented the latest financial information indicating a structural decline in the demand for coal, while I presented on the steps communities could take to transition their regional economy away from coal. I drew on case studies from Kentucky and West Virginia in the United States, where communities have taken on the challenge of transitioning their regional economies away from coal mining by focusing on five areas: 1) Retraining, retiring and redeploying workers; 2) Ensuring the proper rehabilitation of mine sites as an opportunity to create jobs; 3) Investing in renewable energy and energy efficiency businesses; 4) Revitalising existing industries such as agriculture, tourism and education; and 5) Lobbying government to upgrade local infrastructure and provide assistance to attract new industries. Before arriving in Mackay, we were warned that we would meet with a lot of opposition and scepticism, as most people were strongly in favour of the expansion of coal. But something strange happened – after each presentation, my phone started to ring and emails started to pour in. People wanted to know what they could do to build a future beyond coal. Curiously however, it was not the usual suspects who were calling, but a mix of local councillors, business owners and industry leaders who publicly supported coal and were quick to assert they weren’t ‘a greenie’. In response, I returned to Mackay and the Whitsundays to meet with interested groups about starting an economic transitions project. It surprised me how desperate people were to talk, many confiding that it was the first time they felt safe to question the future of coal. Many expressed that while they were concerned about existing and planned projects, they also did not have much hope for the economy beyond coal, as they could not imagine how jobs could be replaced and how investment would come in to support the regional economy. They also talked about the problems they were already facing because of the downturn. Parents worried about their children who had done their apprenticeships through the mines, or who were hugely indebted with over-inflated mortgages on the back of high incomes that no longer existed. Others talked about the closure of small businesses, and the number of families leaving the region. Everyone worried about the newest round of layoffs. In each conversation, people were heavy with a sense of despair and profound disempowerment. The tone changed very quickly however when I asked them about other industries, employment options, resources, skills and infrastructure across the region. From despair, the tone shifted to one of curiosity, and then to excitement as they reflected on the range of opportunities tied to being the largest vegetable growing area in Australia; to the tertiary and vocational education institutions based locally; to the different types of tourism across the region; to being a large regional centre, and to the fishing industry. What has happened to all the royalties generated through the coal boom and how do we ensure that this money goes towards upgrading local infrastructure, training to transition workers into new areas, and to invest in new industries? What has happened to our local agriculture? Why is our government letting our best agricultural land be sold to the Chinese? When did everything become so centralised? Why do we truck our vegetables 1000 kilometres to Brisbane and back before we can buy them? What happened to our local cooperative that operated the sugar mill, ensured fair prices, and helped farmers to access expensive equipment? Where are the unions in all of this? What are they doing to help workers prepare for the end of coal? Why haven’t those solar projects that were approved over a year ago started yet? What is our economy for, if we can’t support our livelihoods in a way that ensures a future for our children? When did we give our power away and lose control of so many resources that used to be held in common? What is the role of the government, if it looks after the interests of companies before the wellbeing of ordinary citizens? Interestingly, these questions are not unique to the Mackay and Whitsunday regions. The same types of question continue to emerge in my conversations with people around Australia about the future of the fossil fuel industry more generally – from Port Augusta and the Latrobe Valley, where people are grappling with the implications of coal-fired plant closure, to Gloucester in New South Wales where the local council is exploring economic alternatives after community opposition saw the abandonment of a coal seam gas project, to Acland in Queensland where communities are battling further coal mine expansions in court. In these questions lies a unique opportunity for economic transformation, as they demonstrate that people are ready for a transition – not just an orderly transition away from coal, but a transition towards a new economic system that tackles the injustices and environmental challenges we face across the country. Countries from Finland to Brazil experimenting with the concept of a Universal Basic Income. Knowing about these options not only encourages hope and creative problem solving, but also helps to ignite our collective imagination about what a better world could look like. Now is the time to build a movement to transition our economy to a post-fossil fuel future. In order to achieve this we need to build new alliances that span green, labour, business and community groups, and we need practical, grounded and context-specific interventions that offer economic alternatives and hope for the future. To paraphrase Quinton Sanfoka, it is not enough to oppose to fossil fuels, we need economic solutions in place to ensure that this transition is not just inevitable, but just as well. For more information on how to join this movement and the work being done to support communities at a grassroots level, visit www.centreforsocialchange.com.au. You have to feel sorry for pundits. Just when they think they have established their trend lines and factored in their variables, along comes a Donald Trump or Bernie Sanders or some Austrian neo-Nazi megalomaniac to disturb a well-established plot. The same thing has happened in the world of energy economics. A quiet revolution, one to rival the digital revolution three decades ago, has been occurring for years right under their noses and most pundits didn’t recognise it. Not only did pundits fail to recognise it, but the business owners whose fortunes depended on reading the signs also did not. Perhaps this is the hallmark of any revolution: that those with vested interests in the Old Order, who frequent the same business and social bubbles that reinforce their prejudices and distort their capacity for reason, will not accurately read the signs and, consequently, will become the victims of cataclysmic events. They will keep repeating mantras like, “Renewable energy will never provide baseload power”, or “Renewable energy is too expensive” as the liquidators move in. Not that the only portents were technological. Certainly we have seen major advances in solar technology and with battery storage and electric cars, but it was also possible to predict the plunging demand for coal from China which has been insisting for years it was going to transition from an energy-intensive manufacturing country to one with a much higher services sector. Instead of taking stock of their basic assumption, many pundits belatedly moved their hopes for coal export markets from China to India, conveniently ignoring repeated assurances from Indian Government sources that they would phase out imported coal in a few years and they were going to put enormous efforts into renewables. Nevertheless, the fossil fuel industries are still powerful and capable of putting up a fight to the end and, even if significant transition is made over the next decade to renewables, it is still likely that we will simply see fossil fuel multinational corporations replaced by large, powerful renewable energy corporations with little or no community involvement or ownership of the process. To make the transition from fossil fuels to renewables as quickly and efficiently as possible there need to be mass movements that stop coal, oil and gas mining, drive divestment from fossil fuels, and pressure governments for radical policy changes. These social movements will, hopefully, merge over the next decade with other, more positive ones that mobilise around the call for economic development initiatives that emphasise the values of democracy, sustainability, community and fairness. Energy policy should have a strong focus on neighbourhood power systems, agriculture and tourism on sustainable practices and natural resource exploitation on the recognition of environmental limits and the needs of future generations. More broadly, a judicious mixture of government intervention and markets – a recipe detested by the neo-liberals – will be needed to bring fairness and accountability to the system. Such a system should be jobs-rich; have in-built flexibility to promote innovation and diverse family and social arrangements; provide welfare and other measures to ensure some in society are not left behind in a changing environment or by such events as disastrous climate change; and enable workers to have a strong say in the direction of their enterprises and communities – a strong involvement in determining their futures. We will have a “new economy”, but it should also be accompanies by a “new democracy”. In the meantime there will also be many jobs fixing up the mess that the old economy left behind. Mining in Queensland is one such area – especially coal mining. 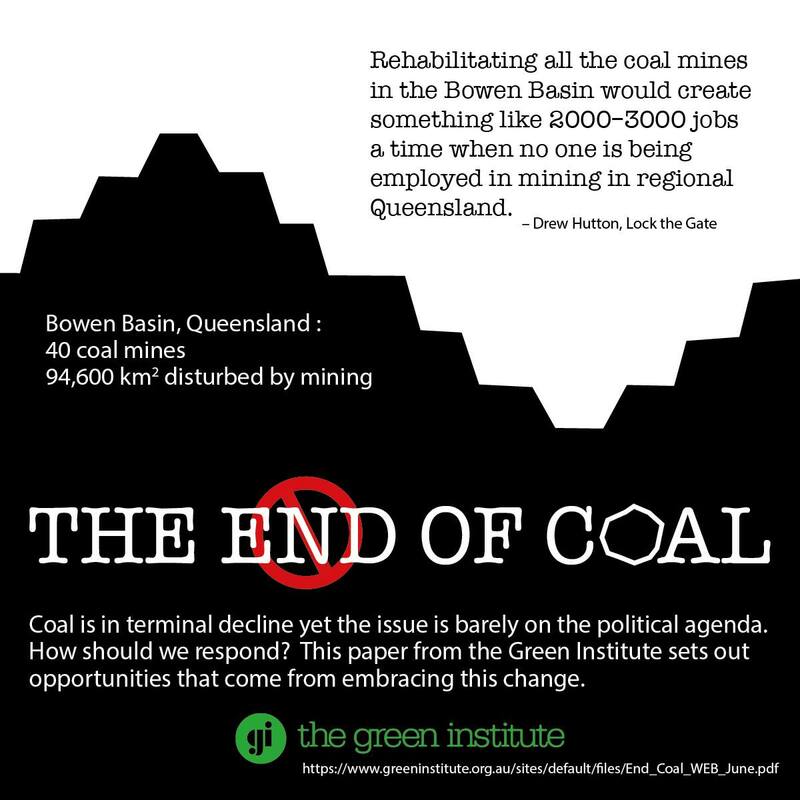 If we take the coal-rich Bowen Basin for example, there are over 40 coal mines with 94,600 square kilometres of land disturbed by mining. Rehabilitating such sites involves re-shaping and re-contouring spoil heaps and waste rock dumps, covering tailings dams to prevent leakage of often highly toxic material, and dealing with large voids left over after open cut mining has finished. These voids often contain high levels of acid, heavy metals or salt. Progressive rehabilitation of the sites is often specified in environmental authorities for the mines but this is rarely done in any sort of systematic way and experts estimate there would be less than 20% of all the sites in the Bowen Basin rehabilitated. Mining companies, especially those which do not have financial assurances lodged with government to adequately cover costs, can resort to several strategies to avoid having to do rehabilitation. The most common of these is putting the mine on “care and maintenance”. This is a term used by the mining companies to indicate the mine has stopped working for only a short while until, for example, the price of coal rises again. In reality, however, the mine is likely to stay closed indefinitely, if for no other reason than coal prices are never likely to rise to profitable heights again. Another recent development is that big mining companies sell out to small mining companies which, presumably, do not have the same high cost structures. Unfortunately, they usually do not have sufficient capital for an adequate financial assurance and so governments need to be alert for this. It is important to know this background because we need to recognise that interventionist government and regulatory enforcement are essential to the creation of so many jobs in the new economy and certainly they are in the area of rehabilitating mine sites. Rehabilitation is not something that companies should be free to choose to do. It is part of the obligations they sign up to when they are given approval to extract minerals which belong to the people and are administered by the state. Now some of these regulations are weak and enforcement of them has been puerile but, nevertheless, they exist. They are just as much a part of the law of the land as prohibitions against assault and robbery, and they should be enforced. If, like the regulations surrounding abortion, brothels and smoking marijuana in Queensland, the authorities are prepared to have a no-prosecution policy as long as the infringements are kept within certain bounds, then that should be publicly recognised. If the State Government has turned the system of mine site regulation into one of self-regulation, then this should be publicly stated. In fact, we have the worst of all worlds. There has never been strong enforcement of regulations against mining companies, but governments keep asserting there is. “We have the strongest system of environmental conditions in the world on this project,” Ministers will assert, knowing there is almost no political will at any level to enforce them. There has also never been a mine relinquished in total to the state by a company because no mine has ever been properly rehabilitated. It is also important to remember that the financial assurances lodged by companies do not comprise the money that is supposed to be used for rehabilitation. It is there only to cover the possibility of a company going belly-up and leaving a substantial backlog. In fact, the companies should be using their own money and doing the rehabilitation progressively as operational areas become available. Therefore private money, backed by financial assurances and regulatory enforcement can create thousands of jobs in regional Queensland. The key to creating this situation is to motivate the companies to change their cultures so that chief financial officers no longer see environmental management issues as an optional extra but as an integral part of their operations that must occupy the front part of their brains along with other more purely profit-making concerns. It is important to appreciate that mining rehabilitation jobs in the present circumstances are what are often called “transition jobs”. They are not part of the “new economy” because they would primarily be fixing up a backlog of problems created by the mining industry’s reluctance to fulfil its obligations. After this backlog has been dealt with, say over the next decade or two, mine site rehabilitation should become what it was always supposed to be: an integral part of any mining operation, done progressively over the life of the mine and in line with world’s best practice so that, wherever possible the land is returned post-mining to a productive, safe and non-polluting land use. Getting this far will involve, as it will with the whole “new economy, new democracy” direction, a combination of effective market mechanisms, a cultural change in the industry and the political will on the part of governments for economic intervention.